I have some questions about manipulations of debt elastic risk premium（as in Schmitt-Grohe and Ubire, 2003）. I’m modeling an open economy new keynesian model with incomplete financial markets. And I use a debt elastic risk premium as in SUG, 2003. But in previous studies, there are some types of this formula. Which is a correct formula? Please see a following file. How do I log-linearize this equation? That depends on what you want to achieve. But only the first one makes sense. 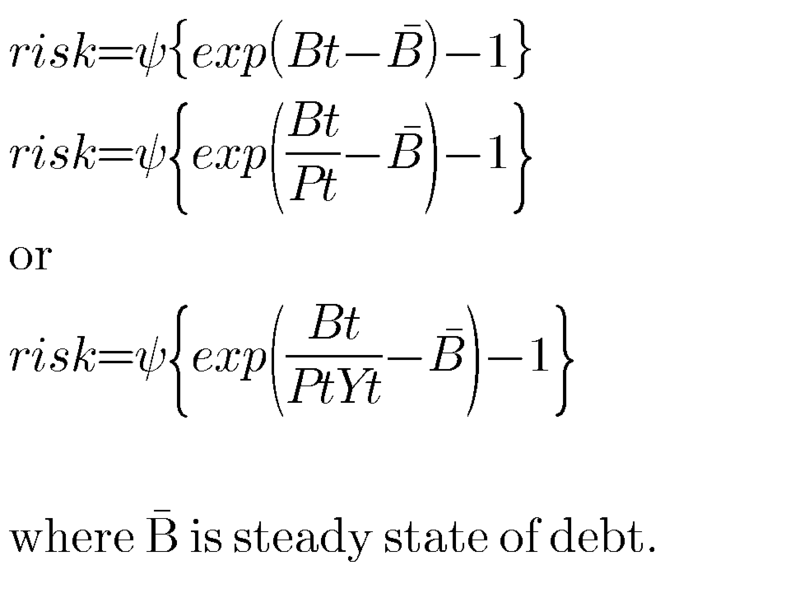 The second one would not make sense, because you are considering differences between real debt and nominal debt (if \bar B is the steady state of B_t). The third one is similarly wrong, because you are considering differences between the debt to GDP ratio and the nominal debt. These are again incomparable objects. 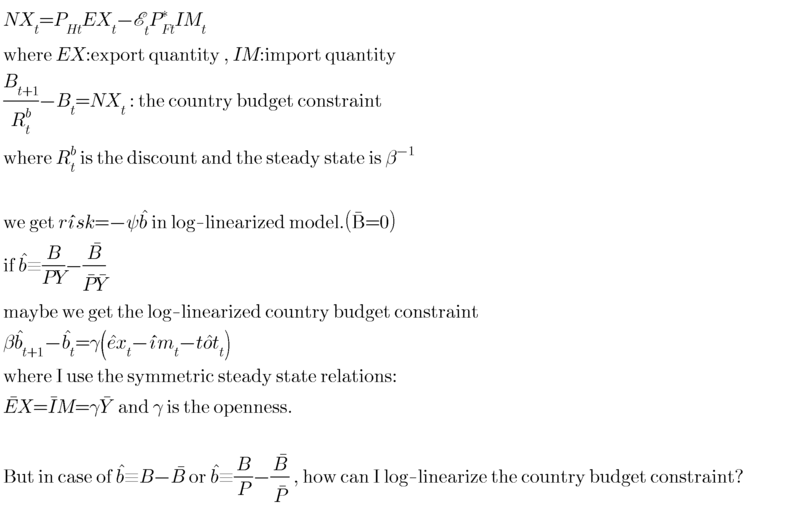 If I create a symmetric two-country NK model, how to deal with the country budget constraint? Your notation must be wrong. From what I can see, B_t is already real bonds. I return to my first question. What is the difference in meaning betweem the case of risk depending on nominal bond , of risk depending on real bond, and on the bond to GDP ratio? 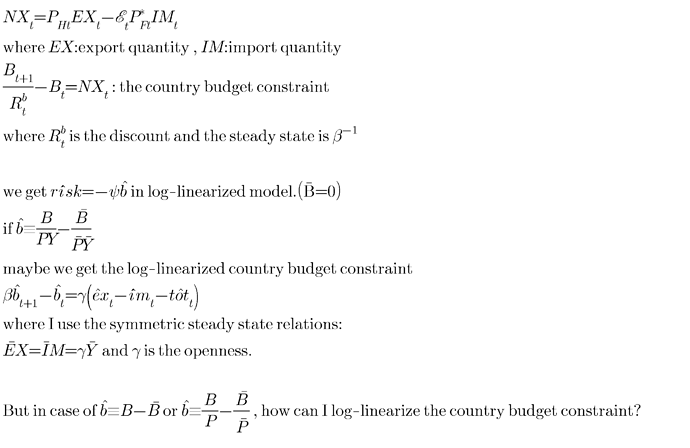 And how should I log-linearize the net exports? The right hand variables｛Ph(t), EX(t), E(t), Pf*(t), IM(t)｝are positive values in steady state ,but the left hand NX(t) has 0 steady state and can be negative. How do I deal with it? This is a matter of specification. You need to decide what you want economically. Does risk increase in the nominal or real level of debt, independent of the level of output. Or is it the debt to GDP ratio that causes risk to rise. Variables that mean 0 are linearized, not log-linearized.